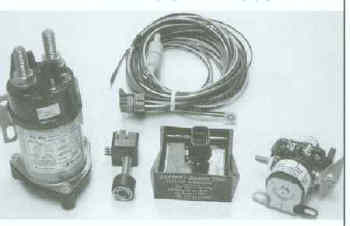 Battery Guard 2000 consists of three major components. Intellitec's patented latching relay (which requires no power to maintain either open or closed positions). The waterproof module, and the dash mounted, LED, reset switch. The relay and potted module are mounted near the battery, to disconnect it from the vehicle's electrical system. The reset switch is mounted in a convenient location on the dash. The entire system comes equipped with an interconnecting harness to simplify the installation. Battery Guard senses the battery voltage to determine the amount of charge in the battery. When the voltage is less than 12.0 volts for four minutes, the battery is then automatically disconnected. When the battery has been disconnected, it can be conveniently reconnected by pressing the Battery Guard Reset Switch. This switch is available in push-button or rocker switch styles. An LED indicator included in the reset switch will blink to indicate the battery has been disconnected. When the battery voltage rises above 13.3 volts, as with a "jump start" or connection to a charger, the battery is automatically reconnected. When the ignition switch is in the ON position, the unit will not disconnect the battery, regardless of the voltage level. When the ignition is in the OFF position, press the dash mounted Reset Switch for three seconds, this will disconnect the battery, testing the disconnect system function. When the ignition is in the ON postion, the LED in the Reset Switch will illuminate for two seconds to indicate the system is operational.